A solitary bagpiper plays his music as the troops arrive in procession for a rifle and bayonet demonstration at the Halifax Citadel National Historic Site in Nova Scotia, Canada. Other members of the 78th Highland Regiment stand alongside the building as this is a solo performance. This is a traditional form of bringing in the troops while performing these demonstrations which many visitors find extremely interesting. 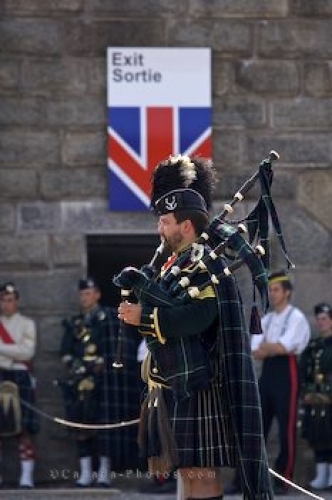 Picture of a solo bagpiper at the Halifax Citadel National Historic Site in Nova Scotia, Canada.